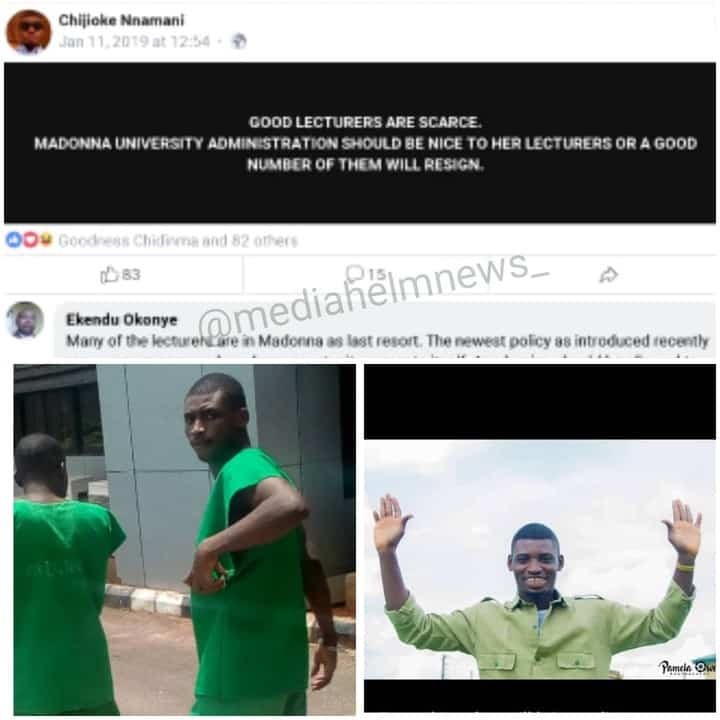 Nigerian lady identified as Goodness Chidimma has cried out for help after Madonna University, Okija got her brother, Chijioke Nnamani, locked up after he advised the institution to be nice to their lecturers on a post he shared on Facebook. 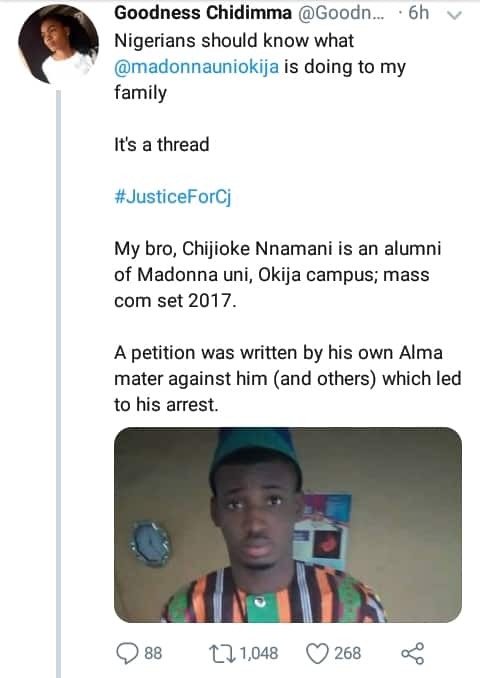 She revealed that her brother has been in prison since 4th of Feb.
My bro, Chijioke Nnamani is an alumni of Madonna uni, Okija campus; mass com set 2017. A petition was written by his own Alma mater against him (and others) which led to his arrest. He was currently serving at @nyscdelta . What did he do? My brother simply wrote a post on Facebook, that good lecturers were scarce and the institution should be nice to them or they might resign. That’s all. I’ve attached pictures below so you can read yourself. A simple regular post, made the institution involve the police and arrest him on grounds of Kidnapping, armed robbery and cultism. He was charged to court but the court threw out the charges. In order to hold him in prison, they changed the case to Cyber crime. @nyscdelta has never showed concern for my brother all through this tough time, Even though they knew the first charges which made them give him out were thrown out. Since 4th of Feb, my brother has been in prison, and this sch has done all they could to end his spirit. But like they say, the. Spirit of a journalist will never be broken. He was supposed to pass out on 14th March alongside his mates. I humbly call on all Nigerians to be aware of this broad daylight oppression, by the authorities of Madonna University. My mum who just became a widow last year December cannot handle this anymore. I call on all the Human Right Activist in Nigeria to come to our rescue. In a country where the right of the common man is disregarded, may God fight for his people.